This new 1PG from Heyoka Studios takes the simple ruleset back to the Middle Ages with a dark thought and murder in its heart! 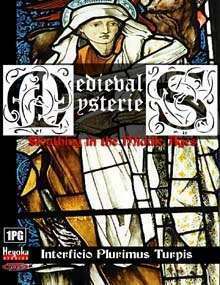 Emulate such medieval sleuths such as Brother Cadfael, Crowner John, Bailiff Simon Puttock, and others as the 1PG emulates the medieval murder mystery. Inside you will find everything you need to play including the rules, character sheets, information for those unfamiliar with the Middle Ages and, most importantly, five ready-to-run adventures. Everything you need for several evening's entertainment for less than five bucks! This title was added to our catalog on September 02, 2007.